Under PierPass 2.0, appointment fees have been reduced from $72.09 per TEU to $31.52 per TEU and are assessed around the clock, as opposed to only during nighttime shifts. Photo credit: Shutterstock.com. PierPass said the shift four months ago from incentive pricing to a flat fee has been agreeable to the industry, and truckers appear to agree, although they warn the effectiveness of the new extended-gates program at the Los Angeles-Long Beach port complex won’t truly be seen until congestion recedes. Despite much angst among retailers and truckers in November when terminal operators in Los Angeles-Long Beach changed the PierPass extended-gates program from an incentive pricing model to a flat fee, the program over the past four months has experienced little pushback from the transportation community. John Cushing, president and CEO of PierPass Inc., told the Los Angeles-Long Beach Propeller Club Thursday that retailers and other beneficial cargo owners (BCOs) are seeing now that terminal operators at other North American ports are beginning to charge fees for extended-gate programs. PierPass, which began operations in 2005, no longer stands out as the only fee-based program. “We don’t hear complaints as much as we used to, now that other ports are going to extended gates. It costs money to run a second shift,” Cushing said. Today, Oakland International Container Terminal and TraPac in Oakland have fee-based extended gate programs, as do two of the terminals at the port of Montreal. The Deltaport and Vanterm terminals in Vancouver, Canada, also charge a fee for mandatory trucker appointments. Weston LaBar, CEO of the Harbor Trucking Association, which represents drayage companies in Southern California, said he agrees with Cushing but that it’s too early to declare victory given the chaos that has ensued the past four months due to the front-loading of imports to avoid threatened tariffs on China. “Retailers are still in the middle of the tariff issue. PierPass is an afterthought right now,” LaBar said. By summer, if tariff-related congestion caused by about 34 extra-loader vessels has dissipated, warehouses are no longer filled beyond capacity, and the ports return to normal operating conditions, a true analysis of the new model, known as PierPass 2.0, will be possible, he said. PierPass was founded by the 12 terminal operators of the West Coast Marine Terminal Operators Association (WCMTOA) in response to a stern warning from the California Legislature in 2003 to either mitigate port-caused traffic congestion in Los Angeles-Long Beach or the legislature would impose a solution. At the time, about 90 percent of the port-generated truck traffic occurred between the hours of 8 a.m. and 5 p.m., Monday through Friday, and finding a solution that would more evenly balance out cargo flows over two work shifts was the only logical way forward, Cushing said. For that reason, the original PierPass pricing model was based on a financial incentive: trucks sent to the harbor during the day would pay a traffic mitigation fee, while trucks visiting during the second shift would not. Revenues from the daytime fees were used to compensate terminals for the additional labor and equipment costs involved in running a night shift. Although the incentive-pricing model achieved its original mandate of relieving daytime traffic on local roads and freeways over the past 13 years, problems ensued as the program matured. The traffic mitigation fee (TMF), increased on an annual basis, reaching $72.09 per TEU last year. Another residual effect of the rising fee was that BCOs, who pay the fee, began sending their truckers to the harbor as early as 3 p.m., with instructions to wait outside the gate until the TMF was no longer charged at 6 p.m. PierPass 2.0 dropped the pricing to a flat $31.52-per-TEU fee assessed on truck calls, regardless of the time of day. Since making the switch, trucks are no longer lining up from 3-6 p.m. in order to take advantage of the lack of nighttime fees, Cushing said. The largest retailers, many of which were already running two or three shifts at their Southern California distribution centers as far back as 2005, favored the original PierPass pricing model because they took delivery of most shipments during the night shift, when no TMF was charged. In hearings before the Federal Maritime Commission and in outreach programs by PierPass Inc., those retailers warned of dire consequences if incentive pricing went away. However, in the four months since PierPass 2.0 was launched on Nov. 19, there has been no discernible change in traffic patterns in the harbor, and certainly no major shift to daytime calls, Cushing said. 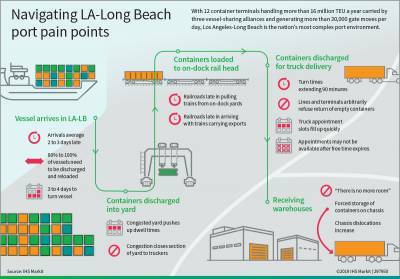 All 12 terminal operators in Los Angeles-Long Beach manage traffic flow at their facilities through mandatory trucker appointments. Like PierPass, the appointment systems continue to evolve as the terminals address concerns raised by truckers and BCOs. PierPass is developing metrics in an attempt to determine why there are still so many no-shows when appointments are made (Cushing said more than 25 percent of truckers who make appointments fail to show up), why some time slots are less attractive to truckers, and whether it is feasible to move to a universal appointment system for the entire harbor. He added that at certain times of the day, especially from midnight to 3 a.m., extended gates attract little support from truckers, even if free storage time is running out and demurrage will be incurred. Rather than making an appointment late that night, truckers will often wait until the next day. LaBar said a variety of factors are involved in mandatory appointments, including federal hours-of-service requirements for drivers, traffic conditions, and terminal congestion problems that limit the ability of drivers to reach the terminal within the two-hour appointment slot. Both the terminal operator and the trucker share responsibility, he said. There are times of the day, such as in the late night and early morning hours, where divers have learned from experience that the terminals will not serve them efficiently. Terminals also frequently refuse to accept the return of empty containers due to cargo surges with no warning, said LaBar. “An appointment is a contract. For the trucker, it should mean, ‘I will show up,’ and for the terminal, it should mean, ‘I will be available to serve you,’” he said. The ports of Los Angeles and Long Beach, and in some cases the trucking community, support the concept of a universal appointment system under which truckers could access a single website to make appointments, as opposed to using the 12 different websites operated individually by the terminals. However, Cushing noted that PierPass metrics show that 81 percent of the truckers make appointments by accessing four portals or fewer, not 12 separate sites. One reason for this is that eModal.com already serves as a joint portal for six of the appointment systems. BCOs, which usually pay the fees associated with extended-gate programs, normally oppose fee-based programs initially, but tend to come around to the idea when port congestion mounts, provided the cost is reasonable and truck turn times improve as a result, said Dan Smith, a partner in the Tioga Group, which has studied extended-gate programs in North America. As carriers and terminals see their individual identities diminish due to the effects of large vessel-sharing alliances, portwide extended-gate programs are quickly becoming a necessity for ports and terminals attempting to handle ever-larger container volumes on fixed footprints, he said. “When you establish extended gates, it opens up a huge amount of capacity,” Smith said.